A lovely day on Margate's seafront and I have been enjoying a very good cappuccinno at Cafe G, watching the thousands of motorcycles roll-in; some of the more remarkable models with considerable envy. 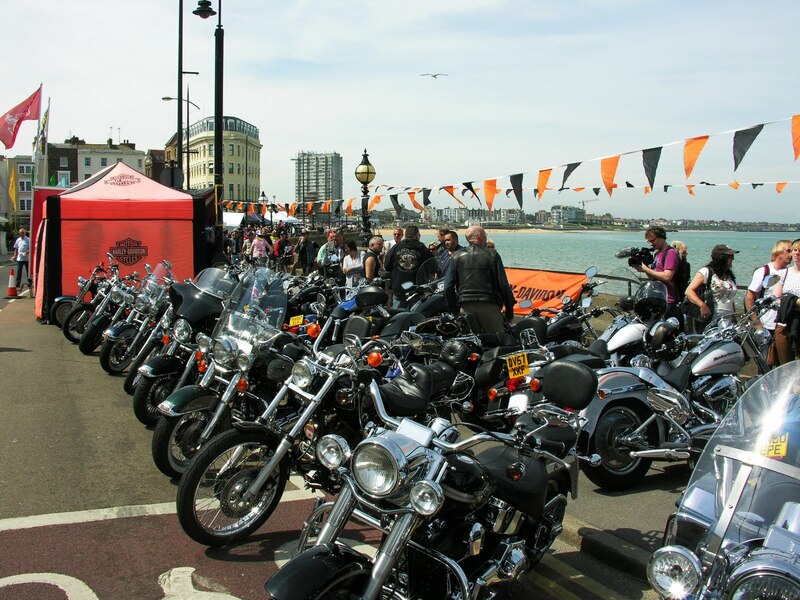 Thanet council has gone to considerable effort to make the town both welcoming and spotless this Bank Holiday weekend for both the annual Ace Cafe motorcycle rally and the Steam Fair at Dreamland. So I rode along the seafront with a critical eye and only spotted one black bag of dumped rubbish opposite the Nayland Rock hotel, with a council refuse truck busily collecting the rubbish from the familiar problem areas; giving the stream of motorcyclists a clean and pleasant view of the town as they arrived. The previous two years of the 'Meltdown'witnessed some pretty awful weather but today is definitely 'Third-time-lucky' and the Old Town, Harbour Arm and seafront cafe's and bars are already gearing-up for a roaring trade. Only a couple of week's to go before Margate's 'Big Weekend' and it looks as if the flypast by the Vulcan bomber, seen at Abingdon is now firmly on the programme. Bring your earplugs and don't forget that this year it's on the seafront at Margate and not Palm Bay and so the cliff-top at Westbrook will be a great spot for deck chairs on the eastern edge of the display line. The Margate Meltdown 2011 was an awesome experience with some great weather to boot. The whole area was spotless and kudos to the council and marshals for doing a great job!!! As a first timer, it was a great experience! Congratulations all round on both Margate Meltdown and Carters Steam Fair, I took a few hundred pictures, for anyone who was unlucky enough to miss today in Margate links to them at http://thanetonline.blogspot.com/2011/05/margate-meltdown-2011-pictures.html a great day and real signs of Margate on the mend. Would it not be lovely if the RAF recommisioned Manston, reintroduced a wing of Vulcans and then practised night bombing runs over a range at Pebble Bay. Bet the nimbys would love that in preference to the odd noisy aging 747. Must agree, the bike's made a pleasant change for Margate at the weekend. Weather behaved, so did the bikers. (However, I did see a motorist get stopped by a Police lady for abusing the one way street rule)(DH). Even the pier was packed and great. The Labour influence on Thanet is making a change for the better. My my, you Tories do get uptight at the slightest comment made against you. Just look back at all the daggers you have sent into Labour backs through the bygone pages. You know, all you politicians are really pathetic ********** aren't you. Whether Tory, LibDem or Labour, most of you couldn't organise a free round in a brewery. This page used to be quite interesting until its owner got brainwashed with Political balderdash. So standard Labour practice. Engage in a bit of spin, claim credit for something they had no impact on and then, when challenged for details, resort to name calling. Who are the pathetic ones. Having said that the leaders hair do is natty. Just trying to wake you all up and do something for the Town, for a change. However, I am very happy at the decision to make a Compulsory Purchase Order of the Dreamland site. Brilliant, all you have to do now is convince JG that you mean business, and get on with it. Unfortunately, it takes balls to do that, and I doubt if any TDC Member has the nuts to do this.